Steve Jaensch beats Lee Stevens and Angus Boase to the line in the criterium. Riverland Cycling Club, 2010 Club Championship Series. The Riverland Cycling Club has completed their Club Championship series, a three stage event held over two Sundays. Stage one is the road race which is the solo event for the first Sunday , this year held on the Lindsay Point Road course. The second Sunday is set aside for the remaining two stages; Winkie hosts the Individual Time Trial followed by Stage Three the Criterium, raced on the Monash Circuit. Members competing in the Championship Series must compete in all three stages for their points to count in the chase to be crowned The Riverland Cycling Club Champion. Stage one began on the Lindsay Point course. With very good riding conditions greeting the riders a great race was expected, and didn't disappoint. With all riders stretching the legs for the first few kilometres it was up to current Club champion, Lee Stevens to make the first serious attack. This attack unhitched a few riders from the main peleton but Stevens could not shake the other strong contenders, so all settled in for the race. At the turn around only five riders remained at the head of the field including, Lee Stevens, Steve Jaensch, Angus Boase, Mick Gray and Glen O'Brien. With approximately 20km's to go in the race Lee Stevens launched the decisive attack with only Steve Jaensch able to bridge the gap and a determined Mick Gray pushing his limits to try and get across to the leading pair. Jaensch and Stevens quickly increased the gap to the chasing riders and settled in to ride to the finish, Mick Gray continued to pound along trying to hold off the chasing pair of Boase and O'Brien and gain third place. In the finish it was Stevens out sprinting Jaensch for first place, with Gray coming home in third place. Boase and O'Brien rolled in for fourth and fifth respectively. Chris Gartery followed for sixth and Peter Weston was seventh, Lee Rasheed was eighth and John Eshman came in ninth. All though, some of these riders were not going to complete all three races which meant the points accumulated from this race would not count. The second stage of the Club Championships; the Individual Time Trial consists of a single timed lap of the Winkie circuit, a distance of 9.6km. Given the favourable conditions for racing, some fast times were expected. The starting order was confirmed and went from last place in the road race through to first place, with one minute intervals between riders. Fastest time went to Lee Stevens with Steve Jaensch a close second and Angus Boase rode in for third. Even after forgetting his riding shoes Angelo Ylia was able to come in for 7th place ahead of John Eshman and Gordon Lawton. The last stage for the Club Championships was the criterium held at Monash. A group of four riders settled in to the race out in front Lee Stevens, Steve Jaensch, Angus Boase and the surprise packet of the Championship series, Glen O'Brien. Behind these four was the race for 5th place overall between Lee Rasheed and Peter Weston, who ever won this battle was going to take the prize for fifth. Stevens tried a few attacks but couldn't shake any of the riders, so all settled in to ride to the line and have a group sprint. Jaensch and Stevens led out the sprint with Boase and O'Brien close behind. In a tight finish Jaensch took the win from Stevens to prevent Stevens taking a clean sweep of the Club Championship race series. Boase was closing in fast but ran out of road and had to settle for third place with O'Brien rolling in for fourth. In the race between Weston and Rasheed the latter had too much power in the sprint for Weston who could only watch on as fifth place rode away. The 2010 Club Championship went to Lee Stevens with the runner up going to Steve Jaensch. Third place overall was Angus Boase and Fourth to Glen O'Brien. Powerhouse Lee Rasheed stormed home for fifth relegating Peter Weston to sixth. Seventh place went to John Eshman, eighth to Angelo Ylia and ninth was club veteran Gordon Lawton. L-R Lee Stevens (FT), Chris Gartery (2nd), Steve Jaensch (1st), Gordon Lawton (3rd), Kevin Heritage. The Riverland Cycling Club hosted the last trophy race for the 2010 season with the running of the Stan Heritage Memorial Road Race. All riders were greeted with perfect cycling weather with hardly a breath of wind and the sun providing warmth for the first time in a long time. All riders were keen for a good race, with Angelo Ylia, John Eshman and the winner of Saturday's Werrimul interclub Handicap, Colin Gordon, getting proceedings under way. They were followed at 9 minutes by Lee Rasheed, Peter Weston and Ruth Strout. A further six minutes back were the dynamic duo of Steve Jaensch and Chris Gartery. At 18 minutes were Angus Boase and Mick Gray with Lee Stevens one minute behind off scratch. The three riders from the chopping block group, the lone scratchie and Colin Gordon would have a tough time stretching the legs after taking part in the previous day's Interclub Handicap held at Werrimul. At twenty five minutes was Gordon Lawton, with a tidy handicap 20km short of his fellow competitors 50km round trip. All riders started strongly, riding well with the favorable conditions with Steve Jaensch and Chris Gartery making the most of their handicap position having caught all but the three front runners and Gordon Lawton by the halfway mark. This made it difficult for the chasing riders of Stevens, Boase and Gray who still hadn't caught anyone by the halfway point. Boase soon dropped off which left only Gray and Stevens to chase the leading riders. Weston and Strout were in their sights and with less than 20km remaining were caught but managed to tag on the back until just short of the finish line. Gray and Stevens managed to only catch two other riders, Colin Gordon and Angelo Ylia within the final kilometre of racing; taking out fourth and Fifth place respectively. The winner of the Stan Heritage Memorial road race, in his maiden winning Trophy Event, went to Steve Jaensch, with Chris Gartery and Gordon Lawton making up the top three placings. Although finishing fourth for the day Lee Stevens managed to sneak home for fastest time ahead of chopping block rider Mick Gray. All riders enjoyed the days racing along with Kevin Heritage who was there to present the riders with their prize money and trophies. A big thank you to Kevin Heritage for his continued support of this race in memory of his father Kevin Heritage. Racing continues next week with an individual time trial followed by scratch races at the Barmera Lakefront. For more information please visit the cycling clubs website at www.riverlandcyclingclub.com. 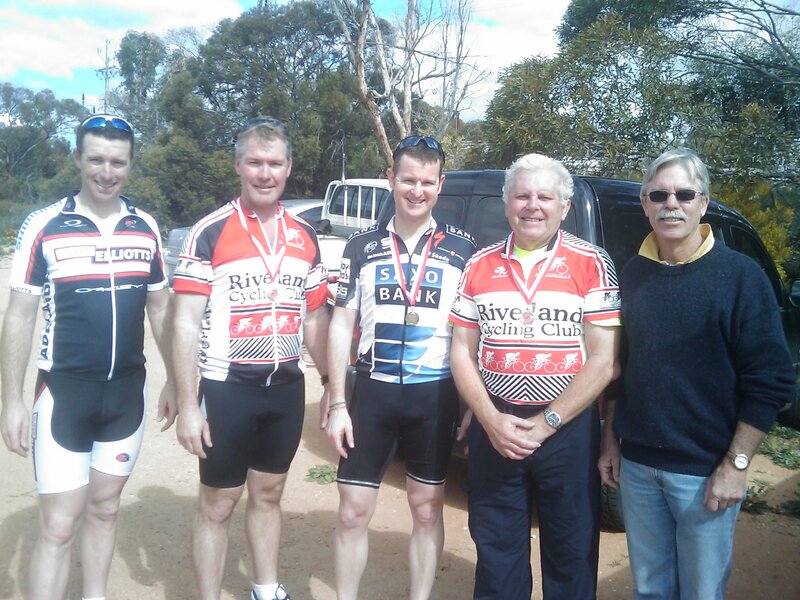 On Sunday the 18th of July the Riverland Cycling Club held the annual Mark Manning Memorial Road race. The race is held in memory of Mark Manning who was tragically killed on the Sturt Highway when out training. The riders were greeted with somewhat cool conditions with a slight North Westerly breeze blowing, giving the scratch riders something to work against. First off the line were the duo of John Eshman and Angelo Ylia, followed closely by Colin Gordon, new father Lee Rasheed and defending champion Brett Anderson. At five minutes from the starters Glen O'Brien, Ruth Strout and Peter Weston started their chase. Next away, with a twelve minute deficit, were Travis McKenzie and Nathan Gregurke, who only just made it to the start line with 15 seconds to spare. Last group to leave and needing to make up sixteen minutes was the scratch bunch made up of visiting rider John Danvers and locals Lee Stevens, Angus Boase and Mick Gray. After the first lap the first three groups had joined to form a large working group, with McKenzie and Gregurke being caught by the scratch group. This created two large groups with all riders taking their turns on the front and pushing the pace. On the return leg of the second lap some riders found the pace too much with Lee Rasheed, John Eshman and Angelo Ylia being dropped and left to ride home alone. With the scratch riders reaching speeds of 45km/h it was going to be a close finish. In the end the front markers held off the fast finishing scratch bunch and with only ten seconds between the two groups on the line it could not have been much closer. In the end the win went to last year's winner Brett Anderson with Colin Gordon taking second place and Glen O'Brien rounding out the podium places with third. In the charge for the line and fastest time honours, John Danvers just pipped Mick Gray. Well done to all riders and we look forward to seeing as many if not more people in this event next year. Fourteen riders fronted up for Sundays 15th running of the Tom Perry Memorial Road Race. The Tom Perry Memorial Handicap was held on Murtho Road and consisted of a 25km outward leg followed by a 25 km return leg. With little wind and a large time deficit to make up the day was always going to be difficult for the back markers. Leaving first was the dynamic duo of John Eshman and Angelo Ylia with Ylia out to defend his title from the same race in 2009. They were soon followed by Lee Rasheed and Colin Gordon who had to make up seven minutes with Glen O'Brien, Ruth Strout and Peter Weston leaving only three minutes later. At twenty minutes behind the limit group it was Chris Gartery, Steve Jaensch and Nathan Gregurke. Twenty five minutes saw team Pinarello leave with Angus Boase and Mick Gray both aboard their new Pinarello steeds. Giving the limit group a twenty six and a half minute head start were Lee Stevens and ex Riverlander John Danvers. The task was set for all riders today, with Danvers and Stevens catching Gray and Boase early on. With all four setting a cracking pace they never caught any other riders. Strout, Weston and O'Brien worked well and grouped with Gordon and Rasheed at the turn around, with all five then setting their sights on the dynamic duo still ahead of them. This left Jaensch, Gartery and Gregurke in no mans land, trying to catch riders in front but with no help from the faster riders coming from behind. In the end the dynamic duo held off all comers with John Eshman taking the win with defending title holder Angelo Ylia having to settle for second. Not long after was the sprint for the last minor place, with Glen O'Brien just pipping Lee Rasheed, Colin Gordon, Peter Weston and Ruth Strout. A minute later Chris Gartery rolled Steve Jaensch and Nathan Gregurke for 8th place. This left only fastest time to fight for, with only Stevens and Danvers able to take this prize the race was on. Boase came home in 11th place with Lee Stevens taking fastest time followed up by Danvers and Gray. Tom Perry's daughter, Di DeCol braved the early morning chill to present the trophies to the place getters. Some special presentations were also made with Peter Weston taking home the prize for eldest competitor, Ruth Strout receiving the prize for first (and only) female and John Danvers was especially mentioned for making the trip up for this race. John Danvers having won this event previously had made a special journey to the Riverland to compete in this race. The Riverland Cycling Club would like to thank Di and Mirko DeCol for coming along and presenting the trophies today. This gesture was appreciated by all competitors. The Riverland Cycling Club will be holding another road race next week on the Cooltong course. All riders are invited to attend. For more information please visit www.riverlandcyclingclub.com. L-R: Chris Gartery, John Danvers, Lee Stevens, Glenn O'Brien, Peter Francis. Bob Francis Memorial Road Race. Sunday the 16th of May saw 10 riders present for the 20th running of the Bob Francis Memorial road race, which is held on Lindsay Point road, Paringa. With Dolce and Peter Francis in attendance to see the riders off, all riders were eager to take the win. Gordon Lawton set off first being the only rider to tackle the 46km on his own. He was followed by the trio of John Eshman, Colin Gordon and Angelo Ylia who started 15 minutes in arrears. At 24 minutes the pairing of Glen O'Brien and Ruth Strout were allowed to start, with a strong ride these two riders were always going to be hard to beat. The chopping block group consisted of Chris Gartery and Nathan Gregurke who had a 33 minute deficit to the lone starter of Gordon Lawton. Following them at the 36 minute mark were the scratch trio of Lee Stevens, Angus Boase and former Riverlander John Danvers. All riders rode strong into the stiff headwind on the outward leg, with only Angus Boase succumbing to the pace of his fellow scratch riders. A six hour MTB race the previous weekend did not help his cause. Lee Stevens and John Danvers caught the two riders in front of them, Nathan Gregurke and Chris Gartery, with all riders working together well up to the turn around point. With a tail wind home the back markers were going to struggle to catch the remaining riders. As the riders at the front of the race got together, they formed a strong working group making it difficult for the remaining riders to make the junction. The race all came together with less than three kilometres to the finish line. Chris Gartery was the first to make his move of the front of the race. He took off with over a kilometre remaining. Lee Stevens tried to go with him but was tiring quickly; John Danvers bridged the gap and tried to get Chris Gartery to the line. Lee Stevens, Glen O'Brien and Ruth Strout formed a quick working group; this kept Chris Gartery in their sight. This allowed Lee Stevens the chance to round up Chris Gartery and make the chase for John Danvers. With all their energy spent Lee Stevens claimed first local line honours behind John Danvers, whilst Chris Gartery, Glen O'Brien and Ruth Strout accomplished a top five place. All riders except for Angus Boase finished within one minute of the winner making this the closest handicapped road race for a long time. 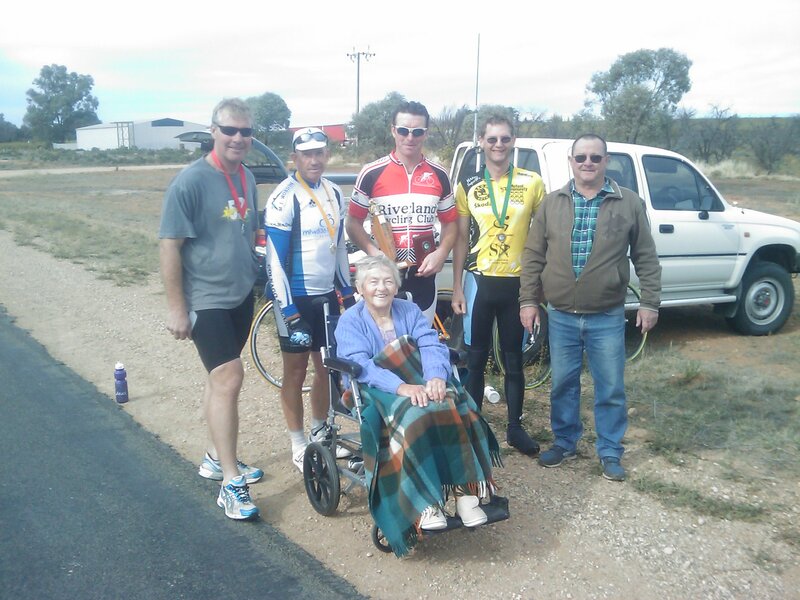 The Riverland Cycling Club would like to thank the Francis family for their continued support of this race. To have 20 years of support for one race is a fantastic achievement and we hope it continues for at least another 20 years. For more information please visit www.riverlandcyclingclub.com. On Sunday the 25th of April the Riverland Cycling Club hosted Mildura-Coomealla Cycling Club with a road race held on Murtho Road, Paringa. Forty two riders turned up on the day with eight junior riders completing a 30km race and thirty four senior riders tackling 50km of Murtho Road. In the juniors race Lachlan Ryan was off first followed three minutes later by his brother Martin. Toby Simpson and local rider Danika Spillsbury were off next at 15 minutes. At the 19 minute mark the next local rider away was James Crosby in the chopping block group with Thomas Allford followed by Kade Boase and Ben Athorn in the scratch. In the end first place went to visitor Martin Ryan with Toby Simpson and Danika Spillsbury filling the minor placings. Fastest time went to visiting rider Ben Athorn. The senior's race started with locals Gordon Lawton and Angelo Ylia. 11 minutes later Peter Grosser, Alison Curry and Terry Miller began. From the 17 minute mark were Gary Simpson, Lee Rasheed and Colin Gordon. The next group away, at 20 minutes, were all local riders- Peter Weston, Ruth Strout, Heath Pillen and Paul Santos. Second chopping block group were Barry Pollock, Michael Allford, Chris Stevens, Chris Gartery, Travis McKenzie and Ryan Clifford. Chopping block was the biggest group for the day with nine riders- Taryn Heather, Rob Akkermans, Andrew Ryan, Tom Athorn, Nathan Gregurke, Angus Boase, Mick Gray, Craig Spillsbury and Garry Pitt. Scratch consisted mainly of Mildura-Coomealla riders with the only local being Lee Stevens, taking up the challenge to ride with Kevin Tankard, Gary Henderson, Richard Hale, Mark Phillips, Dean Taylor and Nathan Langley. Most groups managed to stick together for the race, making the most of the tail wind on the way out to the turnaround with all riders setting a cracking pace, especially the scratch riders who had averaged 47km/h for the first half of the race. The second chopping block group used the advantage of their handicap to hold off all chasing riders whilst catching every rider in front of them and it was this group that fought out the sprint for the major places, with Michael Allford just pipping Barry Pollock for the win with Travis McKenzie coming home for third place. Chris Stevens took home fourth place with Garry Simpson taking home some money for coming in fifth place. In the race for fastest time it was down to the scratch riders with Kevin Tankard still having the power in the legs to take the prize after attacking three times in the final kilometre. The Riverland Cycling Club would like to thank all riders who took part, especially those that made the journey across from Mildura. An extra big thankyou also goes to the volunteers who donated their time to help out today- Brad and Elaine Gregurke, Ben Stevens, Janelle Stevens, Glen O'Brien and Roy and Cheryl Stevens. For more information please check out the clubs website at www.riverlandcyclingclub.com.